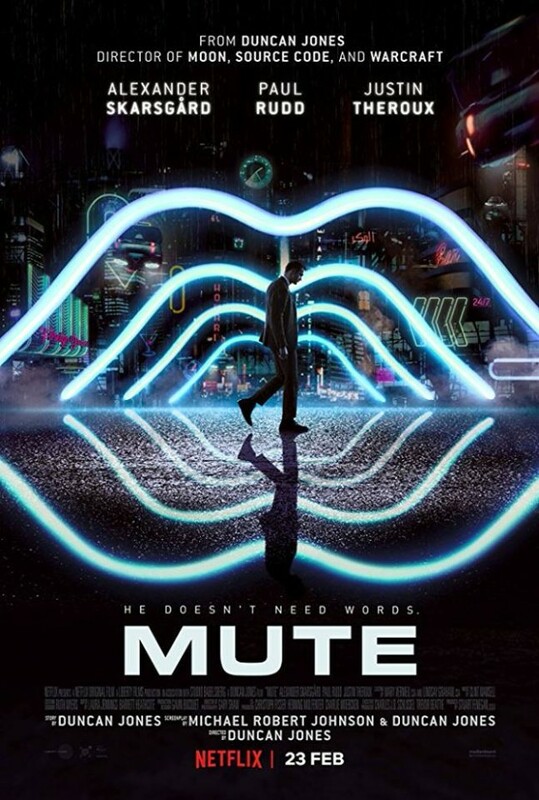 I didn't know this until reading up a bit on it but apparently Mute (2018) has been a passion project for Duncan Jones since before he made his brilliant debut Moon (2009) (and I know I'm not the only one still waiting for him to make another film as good as that one). The tech noir aesthetic in Mute is quite gorgeous, albeit a bit too enslaved to Blade Runner (1982) at times (there's also a really obvious reference to Twin Peaks that I found simultaneously heavy handed and thrilling). The budget that went into the production design really shows though. Clint Mansell returns to Jones' collaborative team to score and the music is sad, pretty and even a bit Bowie-esque at times (Philip Glass' ""Heroes" Symphony" is used early on in the film as well). The three leads are all strong and I liked that Jones wasn't afraid to let a few of the main characters be pretty vile yet charismatic. The plot has some interesting elements but the execution is slipshod and the film just never quite gels. Somehow there's just too much shoehorned in (mystery, detective story, love story, mute hero, childhood trauma), while not a whole lot seems to actually happen. I did enjoy Mute but it's really a shame that it doesn't come together in a more satisfying way. Regrettably, the second sci-fi film of 2018 after Annihilation (released the same day, no less), that just missed the mark of greatness.